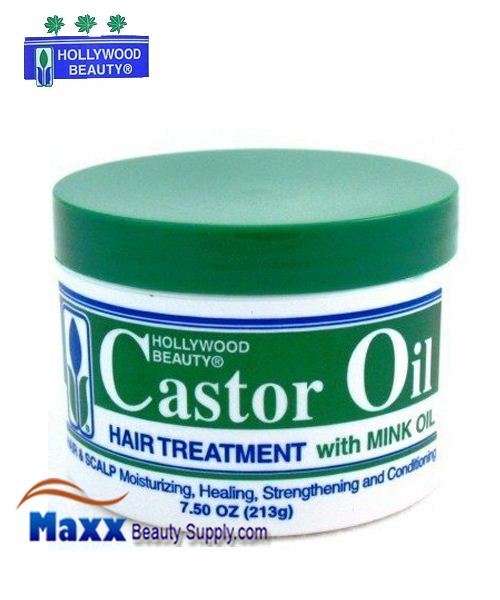 Hollywood Beauty Castor Oil Hair Treatment with Mink Oil Use daily to condition, moisturize and restore natural sheen to your hair and scalp. 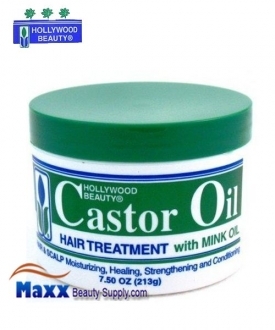 Hollywood Beauty Castor Oil Hair Treatment Helps prevent split ends and breakage. Excellent conditioner for natural, pressed, relaxed or color treated hair. Recommended as a conditioner for babies' hair and skin. Apply daily to wet or dry scalp to keep hair healthy and well conditioned. Hollywood Beauty Castor Oil Hair Treatment with Mink Oil for Hair & Scalp Moisturizing, Healing, Strengthening and Conditioning. Oil Complex , Castor Oil , Mink Oil , Sweet Almond Oil , Tocopherol Acetate Vitamin E , Jojoba Oil , Paraffin Oil , Safflower Oil , Lanolin , Cocoa Butter , Propylparaben , Fragrance .